The story of Varun Agarwal is quite inspiring. The best part of this book is that you can relate to the central idea. We have all had an Anu Aunty in our lives and though you can see that the story is tweaked at times to make the presentation good, this is something that the author openly accepts in the book. Fare enough, the presentation needs to bind the readers. Secondly, as a Bangalorean there are tons of places you can relate to and its fun to come across those references. All in all, the book makes some really good points keeping the mood light, cracking jokes along the way. This is one book that got me interested in reading books once again. I would recommend this book to anyone who is in the struggling phase, anyone who has lived in Bangalore and anyone who just wants to read a book for fun. Go for it, its worth a read! 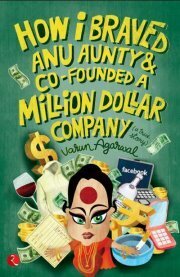 Sign into Goodreads to see if any of your friends have read How I Braved Anu Aunty & Co-Founded A Million Dollar Company.